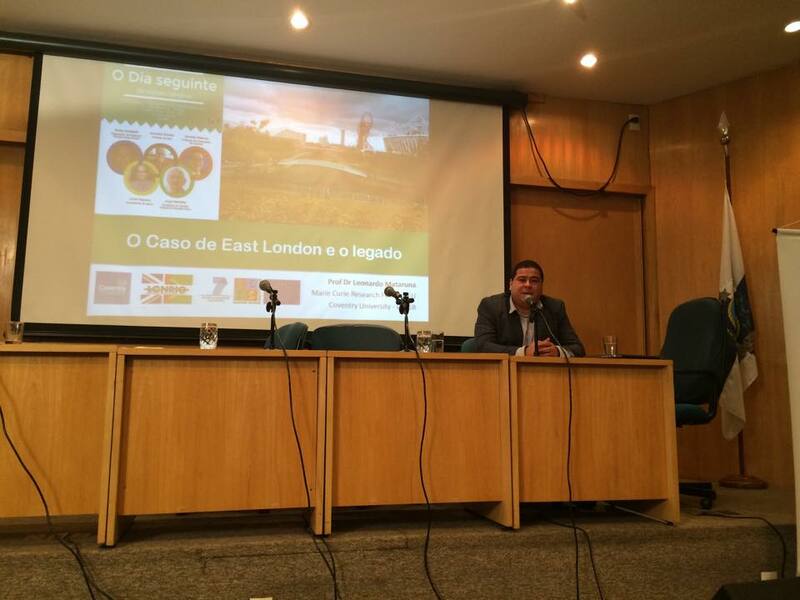 Professor Mataruna talked about the East London case he analysed through a Marie Curie research founded project. Professor Mataruna attended the event “The next day in the Olympic City”, in Rio de Janeiro. The seminar brought together academics, experts in sport mega-events, government officials as well as members of civil society. They all discussed the ramifications that a mega-event like the Olympics has for the host city. Rio de Janeiro prepares to host the Olympics next year, then discussions were focused on the city. The aim was to present and verify projects that can benefit the Rio further by analysing other cases of host cities, like Athens, Greece. Dr. Mataruna talked about the study he conducted in East London, because of the 2012 Olympic Games in the city. This case was analysed through the Marie Curie research founded LONRIO project. Dr. Mataruna and the other participants of the event in Rio. Professor Mataruna talked about the East London case he analysed through a Marie Curie research founded study. Professor Leonardo talking with journalists. During the event they had the opportunity to discuss point of view. Professor Mataruna during his presentation.